Naddour’s Custom Metalworks (previously known as Naddour’s Ornamental Iron) has been beautifying homes and estates for over 38 years. With our experience that has been passed on generation after generation, we’ve mastered the art of fabricating stunning staircase railings, balcony railings, front entry doors, fireplace doors, trellises, gazebos and any other custom metal detail at a custom home. Architects, designers, general contractors and homeowners contact us in the early stages of building the house, even in the drawing/design phases. Once we get contacted during the early stages of designing a house, we help our designers who trust our design recommendations to accomplish what their client is trying to accomplish. We can bid out the projects to help you with the budgetary numbers at the early stages. There are plenty of design options and installations that will help our partners accomplish the look that they’re after, and our expertise comes in handy at that stage. We request special backing in the early stages to avoid re-dos and modification during the build time. During the construction phase, we visit the site to make sure that we’re going through our original plan and work closely with other trades to help them prep for our railing. However, not all projects are pre-planned like that. Usually we get contacted when the railing is needed to be installed, but we’re happy to shift our gears and start up the process and pick up the pace of the building stages. We will sit down with the designers and homeowners, understand what they’re trying to accomplish, go over material sizes and shapes, quality details, installation techniques …all to provide a luxurious feel to the home we’re part of. Our team of designers is dedicated to help our clients and educate them on metals, qualities and concepts. There’s always a room for errors in construction and we work hard on daily basis to improve our methods so that our next fabricated product will look better than the previous one. As we work towards perfection, we established processes to minimize construction errors and add the ease of mind to our partners who trusted us with beautifying their home. We’ll ask the right questions as we guide our partners in envisioning the finished product with the other finished details around it. For example, we need a staircase railing on an open tread staircase in the framing stage. An amateur metal fabricator will miss a lot of details around the railing but we’ll consider all the variables that affect the railings fabrication for a smooth installation. We’ll ask about the finished flooring, finished treads, risers, bullnose, wall skirting, landing transitions, mounting points, blocking for support. And since we treat every home that we work on as ours, we do our best to provide you with the best options available in today’s finest details after discussing your project with our design center. After our product goes to production with all the right info provided by our general contractor and homeowner, our staircase will go into intense reviewing stages to plan for a beautiful looking product that will be installed smoothly. We will send out a special team to get specific measurements and details at the house. At a lot of times, we create a template or a skeleton of the staircase by bending and welding metal bars at the house to get the exact curve for example, and avoid any modification to the railing during installation. This process takes a lot of time, but we believe that fabricating your staircase railing, front entry wrought iron door to the highest standards in the market is our expectation. Once we have the template/detailed measurements and the necessary information to understand our surroundings, we start our fabrication process as we take into consideration all the California code requirements to provide a code compliant and safe product. 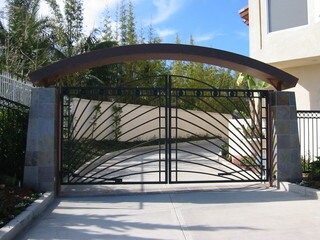 Our facility in Santa Ana helps our clients to get involved in the artistry, handmade and custom metalworks we fabricate. Few days ago, my client who entrusted us with fabricating her interior modern staircase railing and guardrails visited us to check out the rail. During her visit, she saw our Artisans who are fabricating the staircase heat up the iron, hammer the bars and forge the scrolls to fit her railing. She was impressed not only because of our attention to detail but also by the lost art that we do. Yes, we still use an oven and a hammer to bend the iron because there’s no better way to fabricate a custom railing that will fit your home perfectly. We’ll be happy to give you a private tour at our facility and show you the entire process and help you appreciate the eccentric piece of art that we’ll build for you. We use multiple methods and techniques to create a flowing feel for classic/ornate designs and a super clean and sleek look for modern designs. This process which amateurs and cheap metal fabricators lack the expertise or time to do, changes the look of the product from a poorly fabricated product to an outstanding decorative piece of art that you’ll enjoy showing off at yours’ or clients’ estate. Last but not least, the installation of the product is set up in the early stages and the plan has already been put together on how the staircase will be installed. Our installation team who has been loyal and experienced with our products for about 25 years, will visit the home, make sure that we’re being accommodating, clean and respectful to the other trades. Our prep work to preserve our partner’s trades and not damage the finished pieces around us is very important, especially that our metalwork comes in almost at the very end when everything is in place and most probably finished. Just like design, fabrication and finish, our installation process will leave behind a chic looking product that was installed to the original plan discussed with the general contractor so we encounter no surprises. Ofcourse there are secrets to our trade that will enhance the experience of your family and friends who will be around the staircase and enjoy it as much as you will, and we will make sure to share that with you when you visit us as we’re discussing the expectation of your custom staircase railing(modern or ornate), front entry door, balcony railings, structural spiral staircase railings, structural stringer, fireplace door, custom fence and gates…. We’re excited to be part of your new home and we’d love to share our expertise to help you reflect the lifestyle you deserve. P.S: If you don’t like complements, you’re gonna hate us! Although it might seem unlikely, you can give your home a contemporary feel by turning to an ancient craft. Opting for custom wrought iron or other metals rather than wood combines proven longevity with endless design choices, according to Tony Medina, vice president of marketing and sales as well as the designer at Baltic Iron Doors/Naddour’s Ornamental Iron in Santa Ana. Though the company is known for wrought iron, it also uses other metals to create one-of-a-kind pieces. Built to last. While the designs may look delicate, the products’ longevity is legendary when the metal is finished properly. Medina says that to ensure the wrought-iron pieces will last, the artisans forgo powder-coating and instead use a hot zinc process to prevent rusting. “It’s especially good outdoors, but it’s good indoors as well, especially near the beach,” he says. Below, Medina suggests three ways to incorporate wrought iron and other metals into your home. If you like wrought iron but your home is a more contemporary style, don’t despair. Although it’s most common in Tuscan-style homes, “you can create any design you want,” Medina says. 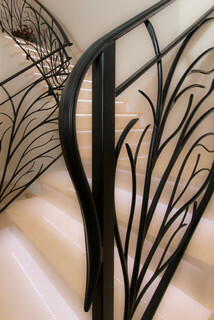 For example, clients in Laguna Niguel wanted a wrought-iron staircase railing but were looking for a design that fit with their preferred transitional style. Medina sketched a vine-inspired look that was both fluid and airy. “They asked if that was really possible,” he says. The resulting railing, seen here, and matching pattern on the front doors give the home a more modern touch and provide a nice contrast to the white walls and marble floors. Looking for a show-stopping feature? Consider something that will come to life at night. “Don’t think you have to limit your look,” Medina says. Clients in the Holmby Hills neighborhood of Los Angeles asked for a modern design that hadn’t been seen before for the banister and railing in the custom home seen here. 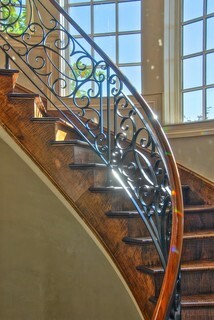 Medina created a railing of polished pewter to echo the angles that define the house. 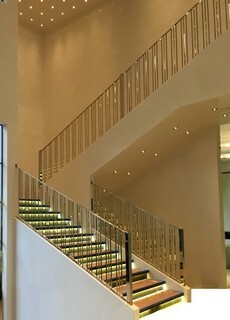 The surface reflects the light from the multiple overhead fixtures as well as the lighting underneath the bullnose of the steps. The result is a staircase that appears to glow at night. Create a design that plays off your surroundings. 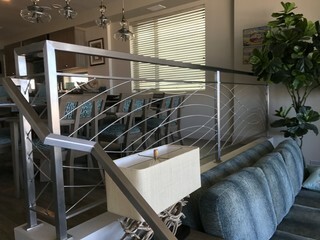 For a contemporary home in the Balboa area of Newport Beach, that took the form of the railing seen here, positioned between the kitchen/dining area and the seating area overlooking the ocean. Rather than copying the straight lines in the home’s other railings, Medina designed gently curving stainless steel arcs to give the “showcase” railing a wave-inspired look and reflect the home’s waterfront location. “It was very difficult to weld,” he says, but the result provided the clean look the homeowners wanted and the durability the location needed.